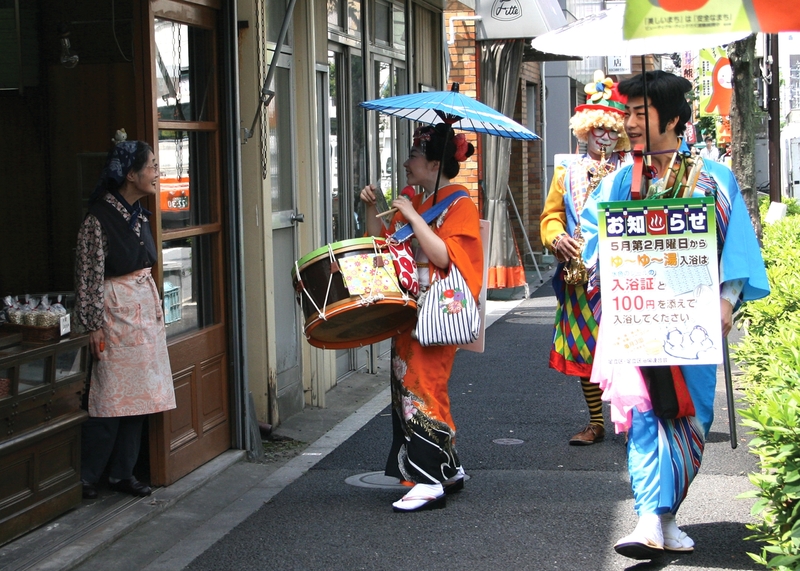 In my July 17 column in The Japan Times, I write about chindonya, ちんどう屋　a delightfully wacky form of street advertising that’s making a comeback here in Japan. 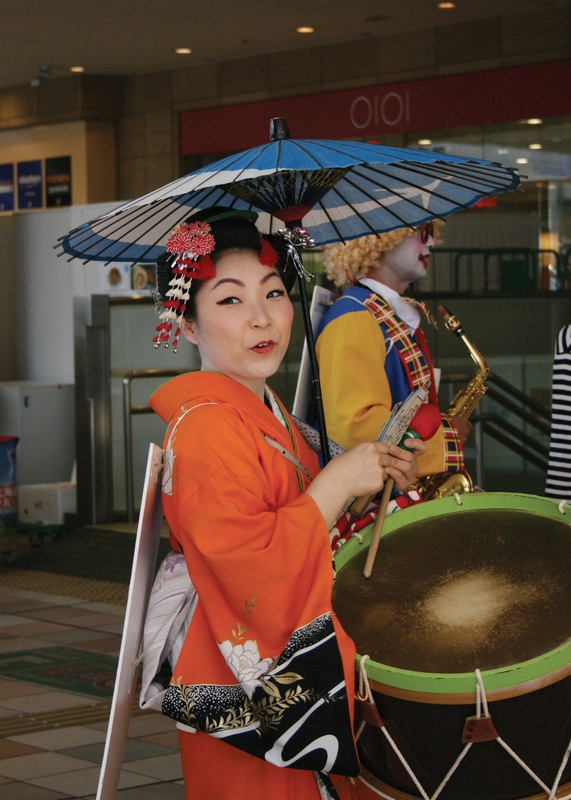 The picture above provides a slightly better view of the most distinctive of the instruments used by chindonya troupes, the chindon taiko (drum). It’s the three-in-one drum and gong set worn by the lead guy in the picture above. 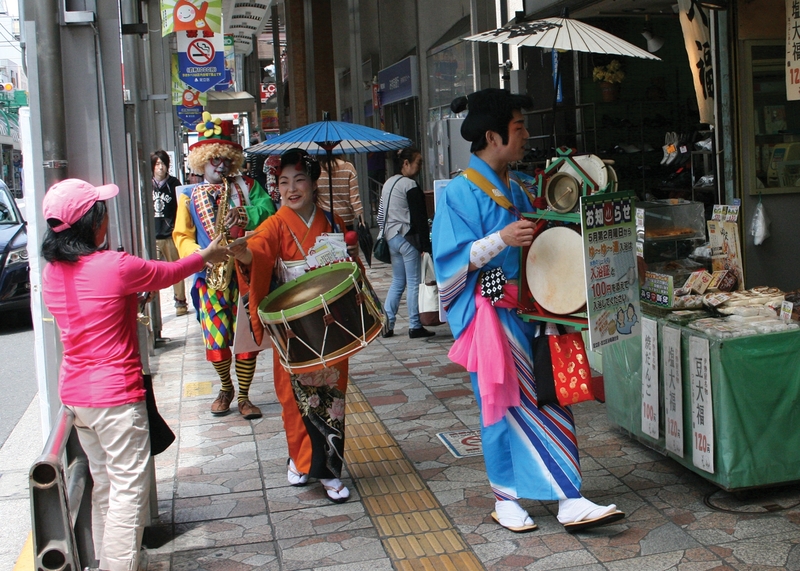 The performers in the picture above are professional chindonya in the employ of Chindon Geinōsha チンドン芸能社. I really want you to hear the chindonya sound, so I went through a whole mess of online videos and selected the best examples of the best hits, including Yonchome 「四丁目」,　Ringo no Uta 「りんごの唄」(The Apple Song) aaaand the song that says “chindonya” like no other, Take ni Suzume 「竹に雀」(Sparrow in the Bamboo). And just in case YouTube goes down the tube — there’s talk it might here in Japan, because of proposed government restrictions — you can also hear Take ni Suzume on the Chindonya Championship website here. More photos of chindonya on the job. 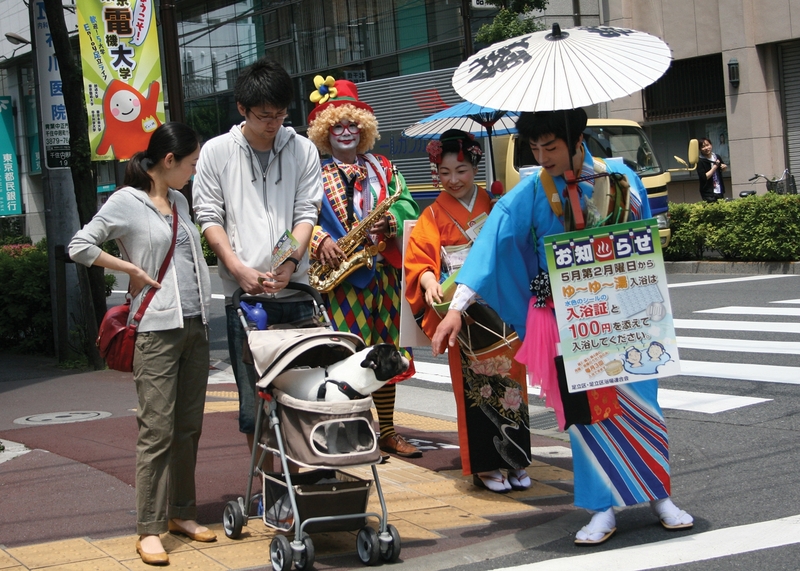 If the dog in the baby carriage shocks you, read my post on Japan’s pampered pets. Later, I had a casual moment with chindonya Nagata Mika and Hisashi, the proprietors of Chindon Geinōsha. 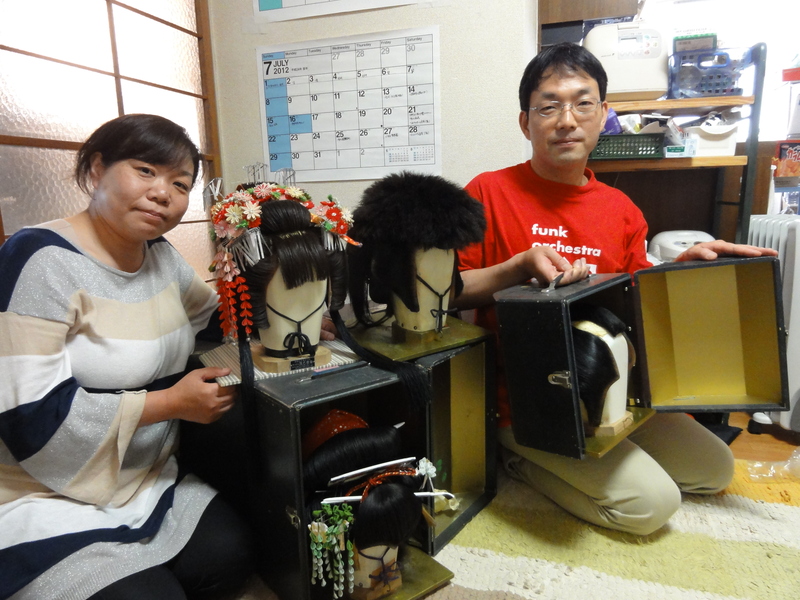 Here they sit without their makeup, posing with just a few of their hairstyles. They have a lot more. By the way, Hisashi speaks English. He says they’d be happy to do weddings or bar mitzvahs. The photos in the post, with the exception of the wig shot, are by Alan Golding. Please don’t use them without his permission. This entry was posted in What the Heck is That? 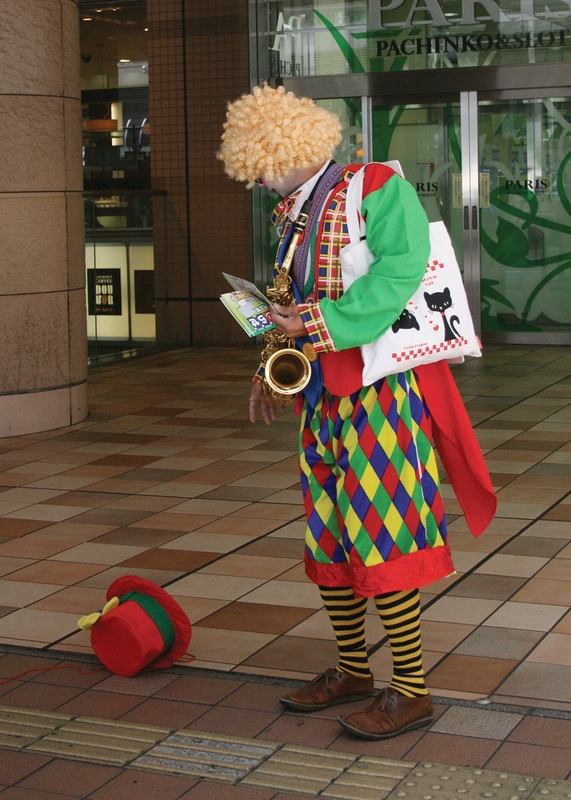 and tagged advertising in Japan, alice gordenker, Chindonya, Japan, what the heck is that?. Bookmark the permalink. It’s always a pleasure getting an email in the morning letting me know you’ve done a new post. No exception here. I’ve shared it around and am going to look at Alan Golding’s photography, next. Wish you’d have thrown a link on “And just in case YouTube goes down the tube — there’s talk it might here in Japan…” because I’ve heard rumblings but, have no source. Tell me it ain’t so ! I look forward to seeing my first chindonya. I hope they’ll make a comeback in Shiga too, otherwise there’s always lovely Toyama in spring. Wow, I really love this blog and I love the column, too! The videos were great and so are the pictures. I’m writing from outside Japan, and I just noticed something in one of the pictures. The pachinko place in the background of the clown picture is named ‘Paris’. Why is that? Despite all the cultural links with Japan and the Japan expo movement, they don’t have pachinko in France as far as I know (I live in France and I haven’t heard of any such thing here).